Nowadays, MBA is one of the most trending course in India. To take admission in the best colleges you need to perform best in CAT exam. On the basis of your rank you’ll get admission in various colleges. But due to any reason if you didn’t give CAT exam or you have not been able to score good. Then don’t worry about it there are many to MBA colleges in India that grant admission in MBA without any entrance test. 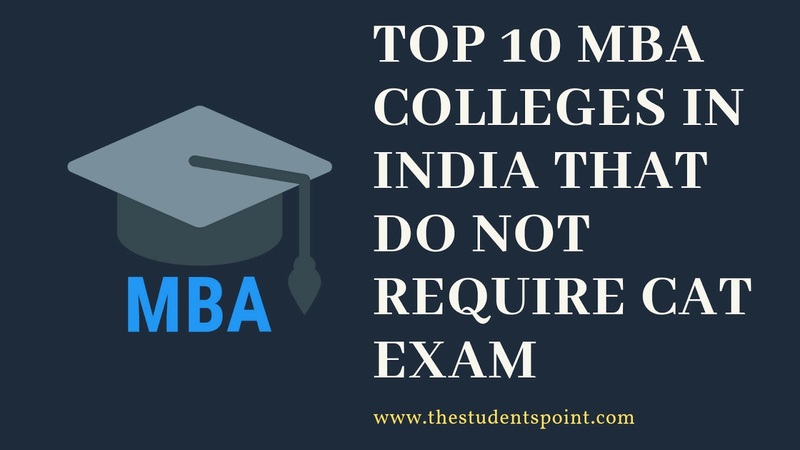 In this article, we’ll provide you the list of top 10 MBA colleges in India that don’t require CAT test to take admission in their full-time MBA Programme. This is one of the most popular MBA college in New Delhi. To take admission in this college you don’t necessarily have to appear for the CAT exam. This institute allows you to take admission on the behalf of your XAT score. Xavier Institute of Management is one of the best business school in India. This institute also provide several doctoral fellow programs also. To take admission in this institute you have to score good in your XAT exam. This institute is the best for MBA in south India. It is situated at Tiruchirappalli also known as Trichy. This institute does not require CAT score to give admission in MBA. The best thing about this institute is that you’ll get job after completing your course. IIFT is most popular institute for MBA located in the capital of our country. You can take direct admission to this institute without appearing in CAT exam. In case you are a foreign candidate, you need to appear in GMAT. This institute conduct their own exam to give admission in MBA. It is the premium institute that ensures you'll get good education, services and also placement. Narsee Monjee University provide list of programs to their students. It is the best university in Mumbai. To take admission in their business and management program you have to clear written test and interview conducted by themselves. If you don’t want to appear in CAT exam and also wants a good college that offers hundred percent placement. Then this is the best college that don't require any tough test to give admission in their courses. This is one of the best reputed college for business and management studies. You need to appear in GATE exam to take admission in this college. Symbiosis International University is also the best place to take admission in MBA. It has variety of full-time two-year postgraduate courses in the field of business management, Industrial Relations, Personnel Management, and Global MBA. Symbiosis university has 11 colleges spread over Bengaluru, Noida, Hyderabad, Pune and Nashik. This is also the top ranked institute which doesn’t require CAT/XAT to take admission in their programme. IILM conduct their own written test, essay writing, group discussion and personal interview. All these are the best top ranked colleges in India for MBA that don’t require CAT exam to take admission. If you want to ask something then feel free to leave a comment in the box. We’ll help you as soon as possible.